For the second issue of our ASEAN Briefing Magazine, we look at the benefits of using Singapore a hub for the management of regional operations throughout ASEAN. We firstly focus on the position of Singapore relative to its competitors, such as the Netherlands and Hong Kong. We then provide step-by-step instructions on corporate establishment, and provide expert insight on maximizing returns through the reduction respective tax burdens. Expanding internationally can be a significant challenge in foreign markets – of which the Association of South East Asian Nations (ASEAN) is no exception. Diverse economies, divergent systems of taxation, and challenging regulations can all present challenges for even the most weathered and adaptive firms. Although crafting a strategy to maximize profit in ASEAN – a region comprised of 10 economies at varying stages of development – may seem a particularly daunting task, effective investment strategy can help to minimize uncertainty and harness ASEAN’s diversity. Of critical importance in this respect is the establishment of regional management centers. Not only can these centers help to bring predictability to regional market entry; more importantly, regional management can act as an effective tool to maximize profits. 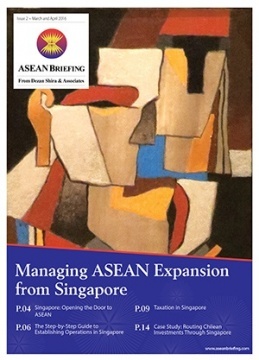 For the second issue of our ASEAN Briefing Magazine, we look at the benefits of using Singapore a hub for the management of regional operations throughout ASEAN. We firstly focus on the position of Singapore relative to its competitors, such as the Netherlands and Hong Kong. We then provide step by step instructions on corporate establishment, and provide expert insight on maximizing returns through the reduction respective tax burdens. As ASEAN continues to integrate, the utility of regional management is likely to see Singapore grow with increasing prominence as the a choice entry point for investment. With a growing team of Tax and Corporate Advisory specialists within Singapore and ASEAN at large, Dezan Shira and Associates is well versed to assist investors with a variety of market entry issues. For questions or information on double taxation, corporate establishment, and other issues related to entering the ASEAN marketplace, please contact our office in Singapore.